Papell with Love: Wplus9 Day 5 June Release Previews - Release Day!!! Wplus9 Day 5 June Release Previews - Release Day!!! Hello Everyone, welcome back to Day 5 Wplus9 Release Day...Yay! I hope that you liked what you have seen these past 5 days of previews. Remember all the New June 2015 products are now available at the Wplus9 Store. 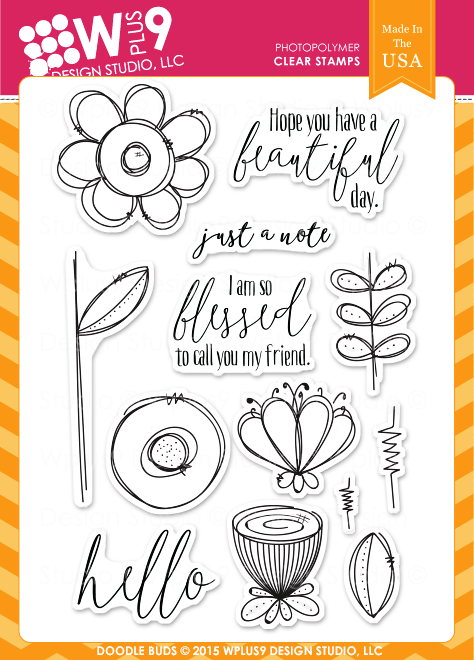 For today's project I am showcasing the new Doodle Buds stamp set and its Coordinating die set. To begin my card I first watercolored my A2 panel in yellow paint from my water palette, let it dry and adhered on my A2 card base. Next, I cut another watercolor paper smaller than the A2 card and watercolored it in very light blue and light green paint for the background then let it dry. Next, I stamped the Doodle Buds outline on a watercolor paper using the PURE COLOR dye ink in Coconut Husk and watercolored the flowers in light pink, yellow, and the leaves in light green then let them dry. 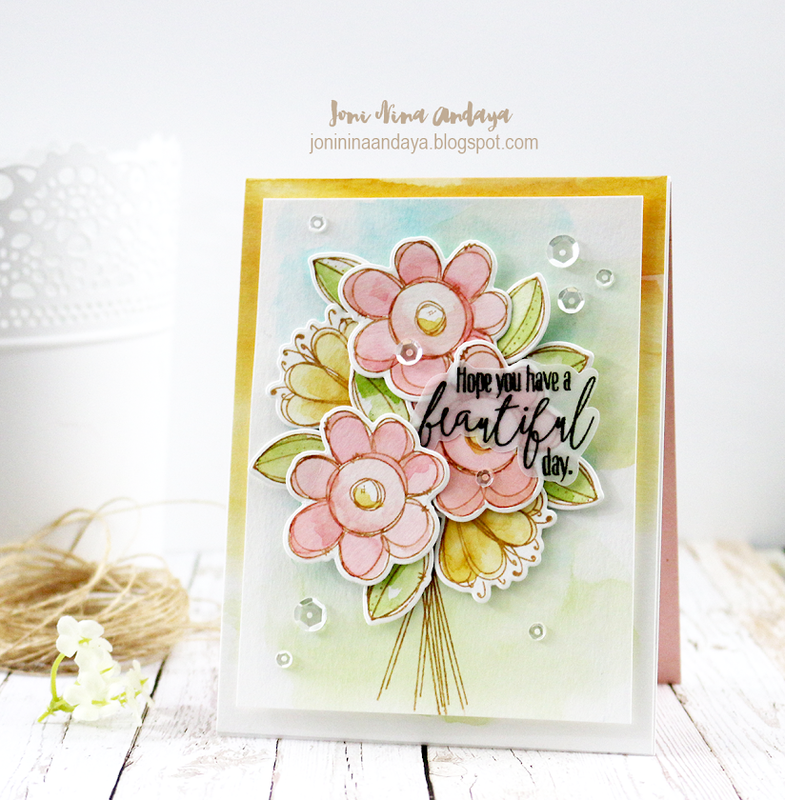 Next, I stamped the stem of the flower image on the watercolored panel and adhered the die-cut Doodle bud pieces to create a bouquet. 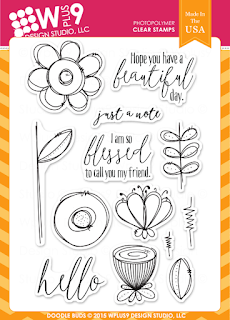 I added the sentiment (from the Doodle Bud as well) that I stamped on the vellumm fussy cut and adhere on top of the flowers. I added the Pretty Pink Posh Sparkling Clear sequins to finish of the card. For my next card, a very easy to make as well, I watercolored the panel in grey paint and little hit of light yellow paint at the bottom for the background. Next, I stamped the image on the watercolor paper, watercolored each one let it dry and die-cut. Next, I assemble each one on the watercolored panel then stamped the sentiment on the middle using the PURE COLOR dye ink in Coconut Husk. To finish off the card I added some Pretty Pink Posh Sparkling Clear sequins. I hope you guys enjoyed more of the watercolored cards. It's amazing how everyone in the design team showcased this stamp in a different way. Beautiful water coloring Joni, I love the cards. Freakin LOVE! That is all. Joni, these are so gorgeous! Love, love, love them! 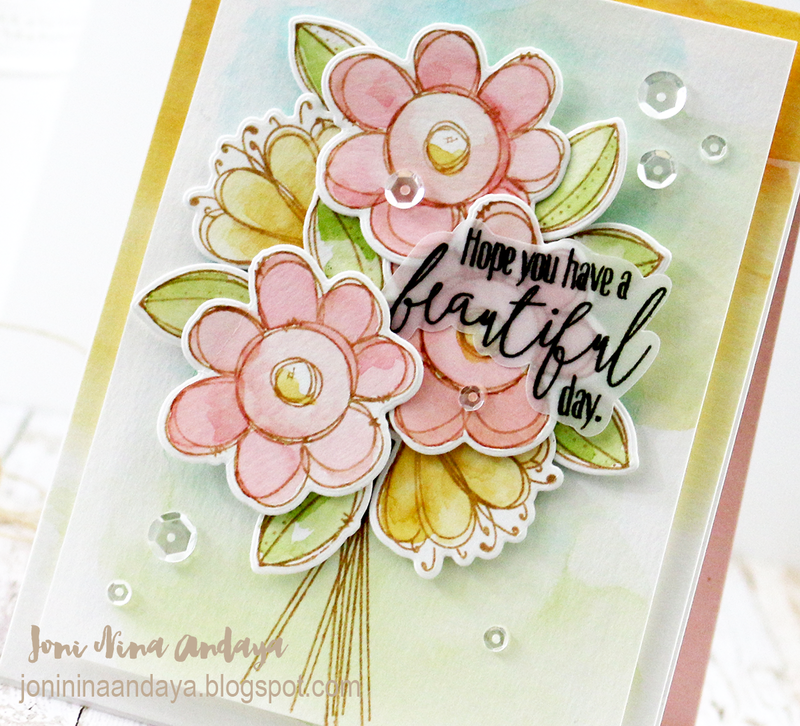 Beautiful cards and such a delicate touch of watercoloring! You are SO crazy talented, Joni! I love these beyond words can express! Beautiful cards, love how they look soft and feminine in watercolour. Wow! 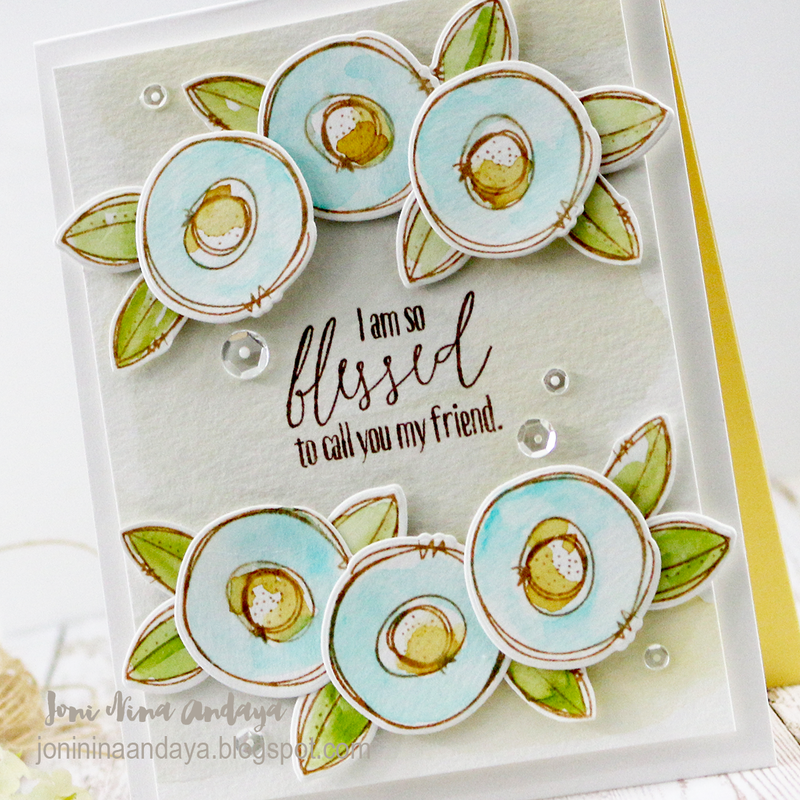 I just love this card with beautiful blue blooms! VERY pretty! I like the both but the blue one is my favorite. These are just so perfect! Love these soft flowers. It's amazing the different cards coming out of the one set. Both these cards are stunning. You definitely showcase this lovely stamp set beautifully, Joni! Soooooooooo gorgeous! LOVING those flowers!!!!!!!!! Wonderful cards. I love the softness. 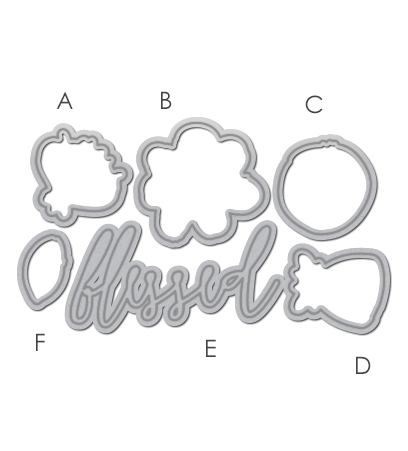 The vellum sentiment adds just a touch of elegance! Thanks for sharing! I really like the So blessed because you showcased the flowers in a different configuration than the usual! Your colors are so pretty!